On arrival you will recieve a full briefing and your instructor will explain in detail what you need to do and what will happen during the flight; the freefall descent and the ride down under the parachute. This briefing generally lasts around 20 minutes and you will have chance to ask any questions. Then it is on with the Skydiver's suit which is designed to go over your normal clothes. Once the tandem parachute harness has been fitted and you have been kitted out in appropriate headgear and goggles you will be taken out to the aircraft. It will take the aircraft around 15-20 minutes to reach the required height over the drop zone. Tandem flights usually take place from 10,000-12,000 feet, sometimes higher. Once height is reached you will exit the aircraft securely attached to your instructor! You will freefall until the instructor open the parachute - usually at around 5,000feet. You will spend about 50 seconds in freefall (depending on exit altitude) during which time you are securely attached to an experienced British Parachute Association (BPA) instructor! You will and reach a speed of around 120 miles per hour. The descent under the large square parachute will take several minutes during which time you will help steer it down to the landing area. The view on a clear day is fantastic so don't forget to enjoy it! Maximim weight 15 stone ( fully clothed). Please wear comfortable clothing eg tracksuit and trainers. 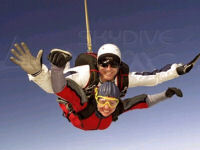 Tandem skydives can be arranged for any day of the week, even in the snow! The only day we are closed is Christmas Day. Includes 3rd party insurance. Please note - Your skydive will take place on the date booked weather permitting - so please be prepared to be flexible!